Regarding hangover cures, Keith Strickland of the B-52s says, "Green Tea is about the best one I have used." I thought I would share this with you now, instead of tomorrow, when it might be too late. A nice, warm cup of hangover cure, waiting for you. 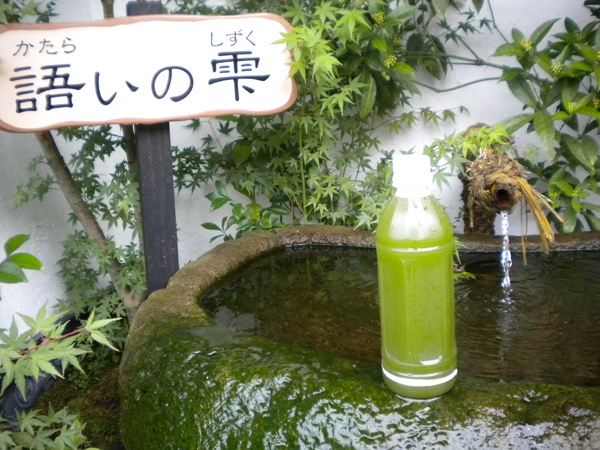 The people of Aso are proud of and particular about their tea and their abundant natural spring water. So much so that the area around Aso shrine has a dozen or so public drinking fountains that serve up naturally flowing natural spring water. The video below showcases these beautifully designed fountains, including one I blogged about recently. With New Year's just around the corner, now is a good time to learn the basics of sake. As the video below shows, quality sake begins with the planting of quality rice. From Rocking in Hakata comes a two-minute time-lapse video of an undokai (sports festival) in Japan. Note also the movement of the ocean in the background. This has nothing even remotely to do with Japan or green tea, but I just had to share this amazing animated short with you all. I may actually pay attention to the "Best Animated Short" category in the Academy Awards this time. Here's an interesting approach to brewing loose-leaf tea: Joey Roth's Sorapot, available at Amazon (when it's not sold out). That is a lot to pay for a bottle of green tea. Not only are quality greens available for much less [hint, hint], but green tea's free-radical-fighting catechins begin breaking down soon after brewing, which is why freshly brewed tea is so much healthier for you. 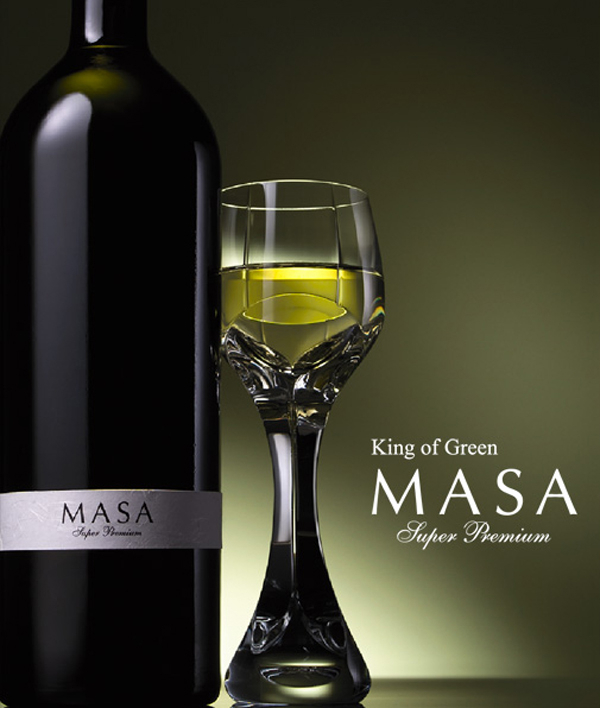 Billed as "the green tea you enjoy in a wine glass." Here are all six parts of the tea documentary "Kyushu, Where Japan's Green Tea Grows" (with English subtitles). 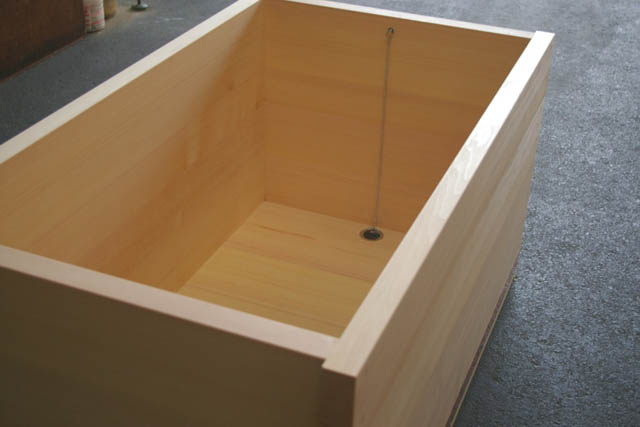 Bartok Design custom-crafts top-quality traditional wooden Japanese bathtubs made from hinoki. And remember: These tubs are for soaking, not washing. But what a soothing, stress-relieving, whole-body-rejuvenating soak it is. A wood tub like this would be such a luxury. I promise to be an environmentally good boy all year if I can have one for Christmas. I never tire of revisiting the spectacular scenery and the warm, wonderful people I encountered during the filming of "Kyushu, Where Japan's Green Tea Grows." So posting the re-subtitled first and second segments to Vimeo was a more than adequate excuse to watch them again. So let us brew up a hot, soothing cup of green tea, sit back, and enjoy the people and places together. The residents of Aso (whence Mellow Monk tea hails) are so proud of their deliciously health natural spring water that the city installed public drinking fountains dispensing this natural spring water, free for locals and visitors alike. In the picture below, we made some cold-brewed matcha using this water, an empty soda bottle, and some of our powdered green tea. It was, needless to say, delectable . . . and so easy to make: Just add matcha powder and water, then put on the cap, shake vigorously and—voilà—a bottle of delicious, healthy, thirst-quenchingly cool matcha. This fountain is named "Katarai no Shizuku," which can mean "murmuring drops" (a reference to the water's sound) but can also mean "water for talking" (referring to how a drinking fountain brings people together) or even "lover's vow water" (which would play well with honeymooners visiting the town). 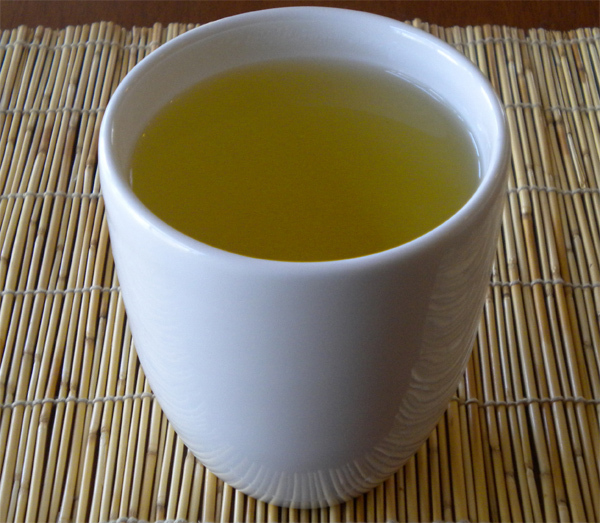 Over at the University of Wisconsin–River Falls, columnist Laura Krawczyk suggests that her fellow students studying for finals add green tea to their stress-busting arsenal. 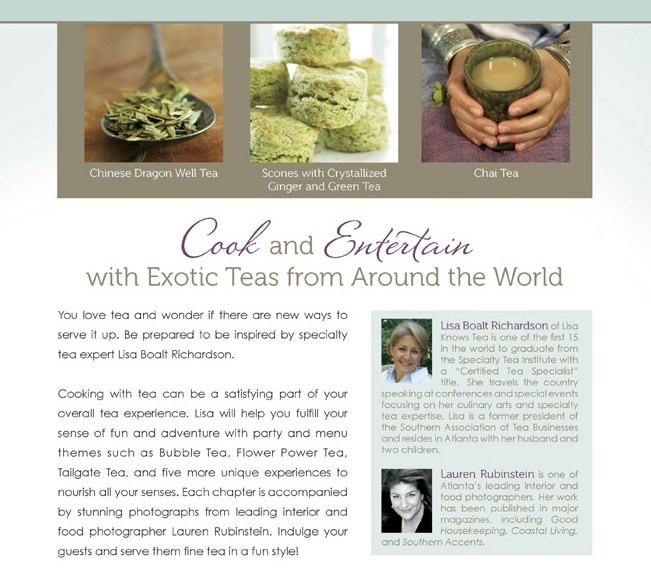 "Cook and entertain with exotic teas from around the world," entices Tea with a Twist , winner of the tea category in the World Cookbook Awards. The book's back cover. Note the exquisite-sounding recipe on the top: "Scones with Crystalized Ginger and Green Tea." We have more videos at YouTube, too. You can also watch this video at Vimeo. Xitang seems like such a peaceful place. 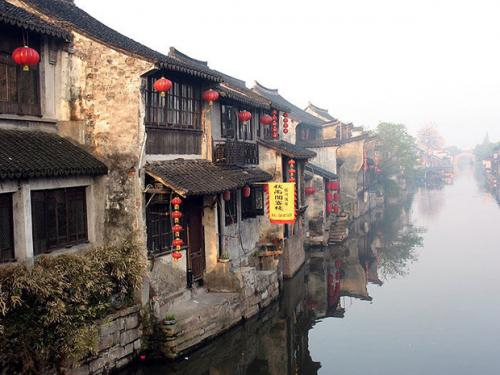 One of the canals for which Xitang is famous ... and mellow. 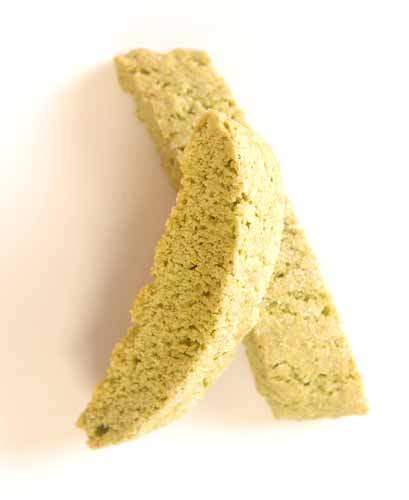 The recipe for green tea shortbread that I posted recently proved popular among us foodies, so here's another yummy-sounding one—for green tea biscotti. Perfect for dipping in a cup of hot green tea. Once again, Mellow Monk is listed in Green America's directory of green businesses, the Green Pages. 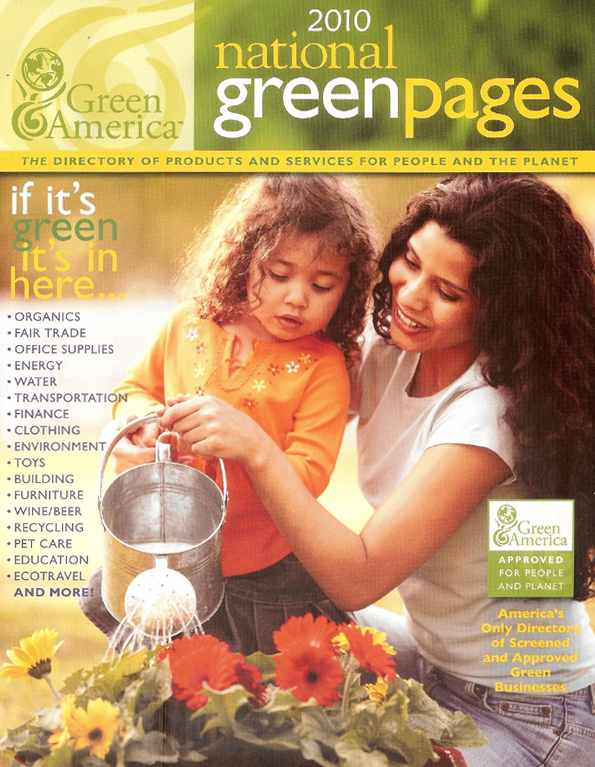 Click to join Green America and get your copy of the Green Pages. You can get one with a donation of only $20, and that gets you other membership benefits, too. Japan is preparing to celebrate the 1,300th anniversary of the country's ancient capital in Nara City. For 1,300 the old gal looks pretty good. 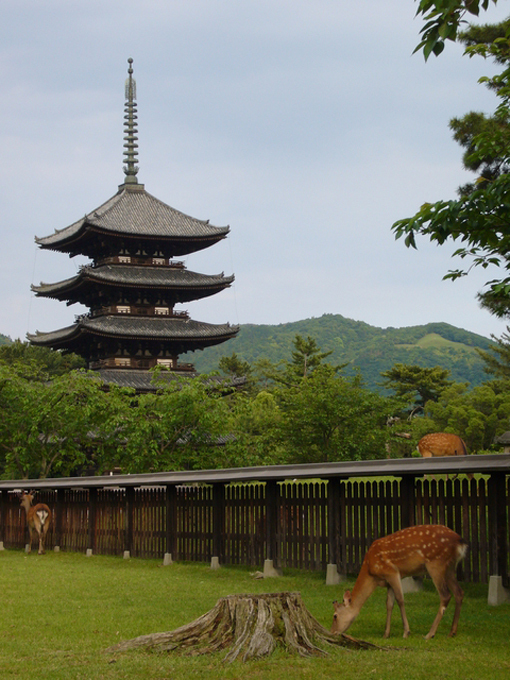 The deer of Nara Park, with the Kofukuji Temple pagoda in the background. A nice story about a tea ceremony teacher and her pupil—who said she used to be stressed out "like a spinning top"—demonstrating sado to a group of 8th graders in Pittsburgh. Learning a skill—mellowness—that will come in handy later in life. I was recently fortunate enough to try Megumi Natto, a brand of naturally made natto crafted in California by Japan Traditional Foods. I was completely knocked out by the fresh, fragrant flavor. Good natto truly is a culinary delight, and Megumi Natto is truly the real deal. This natto is also such a wonderful change of pace from the made-in-Japan natto I usually have, which, by the time it reaches my shores, just isn't the same after weeks of cold storage aboard container ships. And that mass-market natto also contains MSG, whereas Megumi Natto doesn't. The Megumi website is chock full of scrumptious recipes, including natto soba salad, shown below in all its mouthwatering glory. 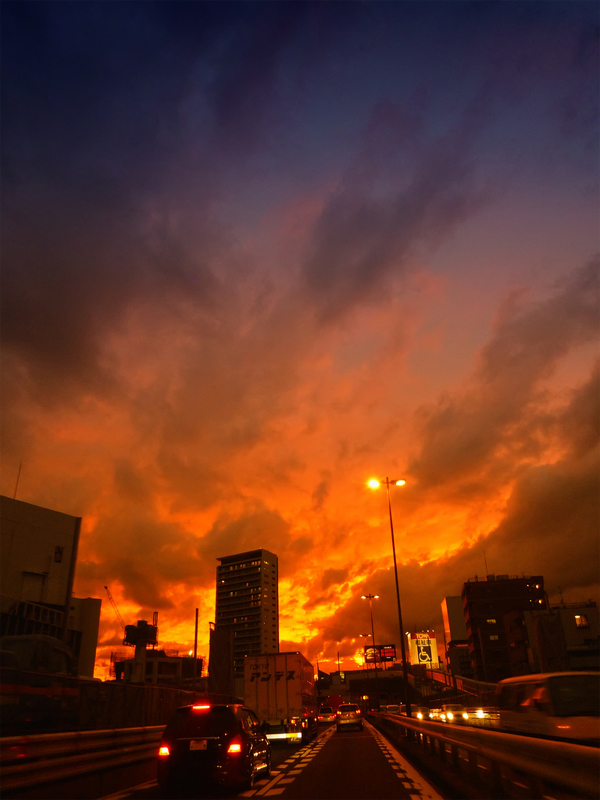 Click to mellow out to the big pic. 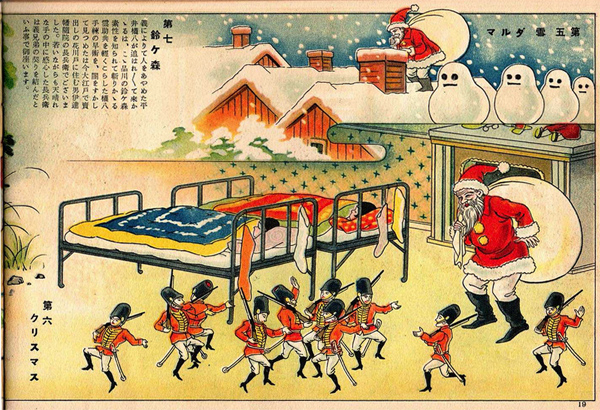 In Japan, Christmas is a relatively recent import, but like any country does when importing a new custom, Japan has made its own tweaks to the holiday. 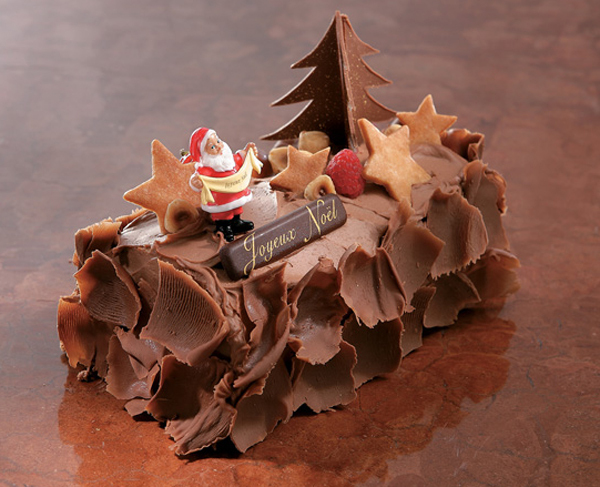 For instance: small, elegant, and for the most part absolutely scrumptious Christmas cakes. From Mitsukoshi in Nihonbashi. Price: ¥3,150 (about US$36). Did I mention that these super-elegant cakes can also be super-expensive? Cakes from less swanky shops are much more affordable but still very tasty—and they all go great with green tea, naturally. Green tea turns these cookies an elegant shade of green and the sparkling sugar makes them glitter. For more green tea flavour, use up to 2 tbsp (30 mL) powdered green tea. 1. Cream butter with granulated sugar until light. 2. Combine flour, green tea powder and salt in a bowl and add to butter mixture. Mix only until combined. Divide into two parts, flatten slightly, wrap and refrigerate for at least one hour. As always, the Monk is willing to sample the results of your culinary experimentations—especially sweet ones. 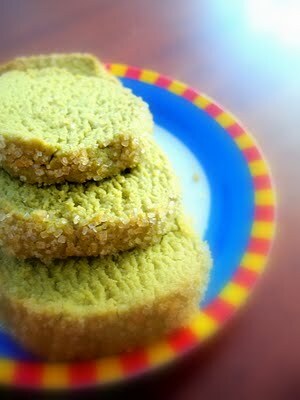 Click the pic to see another scrumptious green tea shortbread recipe.